The struggle by 600 workers laid off from Visteon on 31st March, originally without any pay or benefits, has attracted both interest and solidarity by many other workers, as shown by the translation of their leaflet into 6 other languages and the appearance of workers from other sectors and even other countries at their occupations and pickets. One reason is undoubtedly indignation at the calculated and brutal manner of the sacking by the bosses - hiving off part of the Ford conglomerate to cut their losses and responsibility for redundancy payments, several years of seeking other sources of supply, and announcing the redundancies in a 6 minute meeting as the factory shuts. However, the question of how to respond to redundancies is also a hot topic for the working class today, with unemployment officially over 2 million here in Britain, and shooting up to 17% in Spain, up more than 60,000 in France in March, with new redundancies announced every day - 21,000 jobs to go in General Motors this year, and so on. Solidarity as workers or consumers? The workers at Visteon made important efforts to avoid being isolated in their factories from the first days of the occupations. The occupations started in the Belfast plant and spread to the Enfield and Basildon factories the next day. Although the workers have been ousted from Enfield with the threat of legal action and from Basildon by threat of massive police violence, they remain picketing outside. At the beginning of the occupation it was a focus for solidarity as supporters were welcomed into the Enfield plant. But the struggle could not achieve anything if it remained isolated in or outside these factories. As a worker from Basildon said, "This is not just our battle. It has a knock-on effect for workers at other firms and people in the same boat as us" (Socialist Worker 25/4/09), and this understanding led them to send a delegation to London Metropolitan University where many job losses are planned. The search for solidarity has also included leafleting of Ford plants, the work of the Ford Visteon Workers' Support Group. A demonstration of support in Belfast was accompanied by a 1 hour strike by bus drivers, and rallies outside Enfield on Saturday morning provide an opportunity to both express solidarity and discuss the struggle. Suggestions were made - have you been to this or that Ford plant? The question of our collective strength was raised, are we strong as workers or as consumers? How to put pressure on Ford and Visteon? The focus for the day of action on 25th April was leafleting Ford showrooms, trying to pose a collective strength as consumers against a multinational that is perfectly happy riding out a loss of $1.4 billion in the first quarter of this year. With the aim of getting their redundancy payments and keeping their pensions the workers are also trying to put pressure on Fords and Visteon by calling on workers to black Visteon products. In this typical union framework, Southampton was thought less important because production there has been run down to almost nothing, although going there would show exactly the same concern as going to London Met: the need to get together with other workers who face the same threats. So how does solidarity action work? Can it, for instance, hit the bosses in their pocket? With car production in Britain down by more than 50% due to the economic crisis this hardly seems likely. But workers' solidarity does work. What the ruling class fear above all is strikes spreading. The French state withdrew the CPE when the students were getting more and more support from workers and they feared the struggle would spread. More recently, and closer to home, the Lindsey refinery strike was suddenly brought to an end with 101 new jobs offered, when the workers had shown that they could not only spread the struggle rapidly, but that a minority were putting in question the divisions imposed on them by calling on Italian workers to join the struggle and welcoming the participation of Polish workers at Langage. And for Visteon, we can see that because it has become a focus for solidarity the Visteon parent company have been more willing to give a little ground. Until the start of negotiations, Unite's main role had been in persuading the workers to leave the Enfield plant. It participated in a three pronged attack that effectively undermined the occupation. Legal manipulation and threats were made against the occupation and particularly the convenor was threatened with jail. Once the union became involved in the legal proceedings an undertaking was given that only Unite members would be on the premises - all those who had come to show solidarity and discuss with the workers had to leave, so that it was no longer so easy for the occupation to be the focus of a search for solidarity and more likely to shut them up in isolation. Then workers had to leave to sign on at the job centre. On 9th April Unite asked the workers to leave in order to fulfil their promise to the Court with the promise of a nebulous deal and negotiation, an offer that turned out to be worthless. 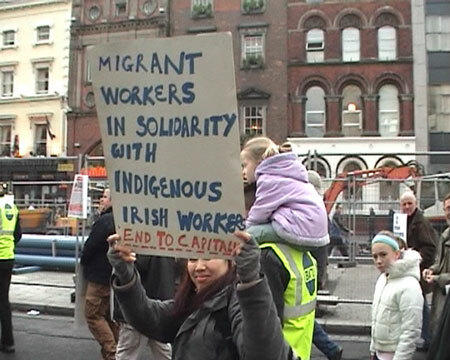 Ret Marut's post on libcom.org sums it up very well: "Early on in the occupation, when it was mentioned that the union might pressure an end to the occupation against workers' wishes, a couple of workers replied ‘ah, but we are the union', as if the workers' collective voice could control the union structure. But once negotiations were organised by officials - on the other side of the world - and the whole process becomes remote and secret from the workers in the hands of specialists, they become dependent... on what they are told". What has the struggle gained? Victory has been announced more than once, for instance when the US parent company agreed to negotiations this was described as a "bosses climb down" by Workers Power April 2009, but the employers' offer at the time was nothing but the legal minimum they were expecting to get from the government anyway. At the time of writing Unite is recommending an improved deal. "They have offered a generous redundancy payment, but unfortunately they are still walking away from the pension" according to Unite spokesman Roger Madison. According to the Financial Times those who were employed by Ford get 52 weeks pay plus 5.2%, and those who were not get 10 times the minimum redundancy pay. While we wait for the full details to be put to the workers at all three sites, if they accept it they have won a small increase in redundancy payment, but at the expense of both jobs and pensions. Nevertheless this is one gain of the struggle. But the first and lasting victory of the struggle is the struggle itself. It has shown that workers will not take layoffs, loss of redundancy payments and pensions, and the contemptuous way they were sacked, without a fight. It is one more experience of struggle, of the attempt to break out of isolation and seek solidarity.